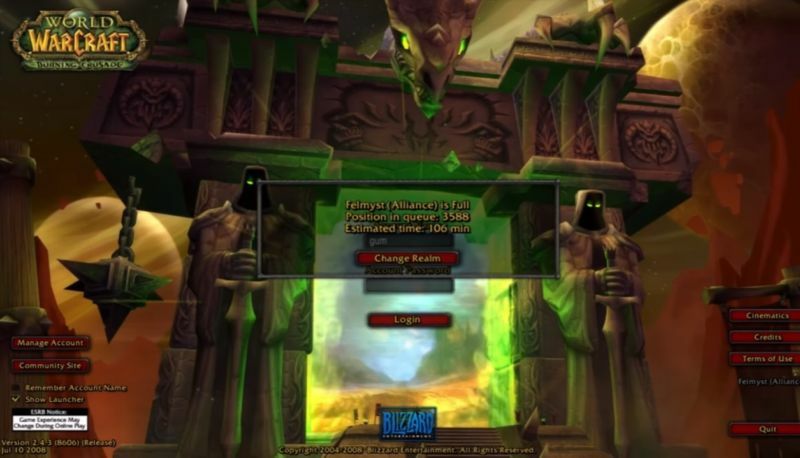 A highly anticipated private server intended to emulate the state of World of Warcraft during the decade-old "Burning Crusade" expansion was shut down by a legal demand delivered by Blizzard representation mere hours after the server launched on Friday. The planned launch of the Felmyst server had been heavily anticipated in the "legacy server" subcommunity of WoW players who seek to emulate a "vanilla" version of the game as it existed before the current slate of expansions and updates changed how the MMO looks, plays, and feels. While other fan-run, "Burning Crusade"-era legacy servers exist, Felmyst had already earned a reputation before launch as one of the best and most complete efforts to capture that well-remembered era of the game in a playable way. But with thousands of players reportedly logged on after that launch Friday afternoon, the Felmyst server was unceremoniously taken down after just five hours. The reason: a cease-and-desist letter from Mitchell Silberberg and Knupp LLP, representing Blizzard, asking for an immediate shutdown under numerous copyright laws. A copy of that letter can be seen in a message from Felmyst coder and creator Gummy52 (which now stands in place of the removed Felmyst webpage and forums) as well as a video Gummy52 posted this morning. The letter accuses Gummy52 and Felmyst of "allow[ing] users to play altered and/or illegitimate copies of WoW online, without the need for a legitimately purchased copy or subscription... As you know, Blizzard has never authorized and, in fact, expressly prohibits the forgoing activity. "Our client's copyrights are extremely valuable and Blizzard takes this matter very seriously," the letter continues. "As you can appreciate, your activity causes serious and irreparable injury to the value and integrity of our client's products and intellectual property." In public responses on his website and a follow-up post on Reddit, Felmyst creator Gummy52 talks of the last four years working on the project while unemployed and struggling with previously undisclosed muscular dystrophy. "This project gave the last four years of my life a sense of purpose that I thoroughly enjoyed," he writes. "I was in the process of upgrading the server's upload speed when I answered the door and then basically sat around in disbelief for a few hours," Gummy writes of receiving the cease-and-desist letter Friday. "During those hours I of course checked if the law firm was a real place, then checked if the number on the paper matched the number on their website, then called them to verify its authenticity." The cease-and-desist request was even more surprising, Gummy writes, because his previous private WoW server project, Scriptcraft, didn't attract any legal interest from Blizzard after launching in 2011. Gummy says he rented the Felmyst server on his own to accommodate up to 3,000 players, paying out of his own pocket rather than accepting donations (which could invite their own legal problems of profiting off the alleged copyright infringement). He says he hoped the small size would help the project fly under the radar, much as Scriptcraft had, and was shocked that the cease-and-desist demand came so quickly. While some have suggested moving the server to another host in another country that might be further removed from Blizzard's legal threats, Gummy says he doesn't have the resources to do anything of the sort on his own. Gummy says he is considering releasing the Felmyst source code so that development can continue elsewhere, but that he has to consider the legal implications of such a move before acting. The Felmyst takedown follows on last year's drama surrounding Nostalrius, a major private WoWserver project that was taken down shortly after its launch, to the consternation of a reported 150,000 active players. While Blizzard agreed to meet with the Nostalrius team last summer, that team eventually tired of waiting for Blizzard to respond to its concerns or to launch an official "legacy" server product. Instead, the Nostalrius team put its weight behind Elysium, a spiritual successor server that launched last December and is still running to this day.